Fill out our simple form and get quotes from local candy floss providers. Inject some fun into your event by hiring a candy floss machine. This is not just about the tasty cloud of fluffy goodness at the end - it's about the theatre and the disbelieving faces of children as sugar is spun and heated before their eyes to create the candy floss. Always a winner at any event; even adults enjoy candy floss as a nostalgic treat! Use our free service to find and book the best Candy Floss suppliers in your area. Whatever flavour or colour takes your fancy, we can provide a fully staffed candy cart for your small or large event. Delicious flavoured candy floss for your parties including children parties and other events and function, you have the option to choose your flavour and the candy floss is run for two hours. Our candy floss cart is available with a choice of different flavours & colours!! We have lots of different flavours and colours of candy floss all made fresh on site. It tastes and smells fantastic. Book some today. We can provide you with a manned candy floss machine for your events. 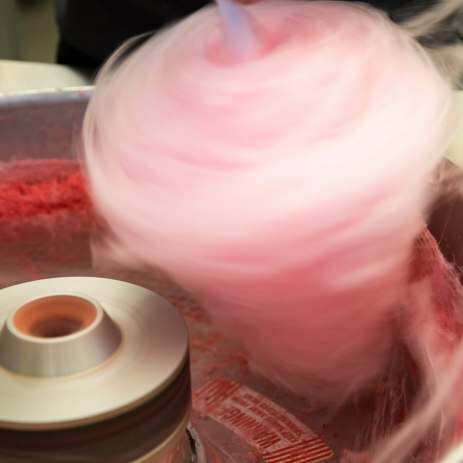 Whether it’s a standalone machine, or part of a candy cart or candy bike, hiring a candy floss machine is a great idea for a range of different events, from children’s parties to wedding receptions and corporate functions. Most suppliers will work with you to create a personalised experience with bespoke branding and flavouring options and usually, the candy floss hire will also include a dedicated server to make and serve the sugary goodness to your guests. To find out more and hear from local candy floss hire suppliers, simply complete a request form now.